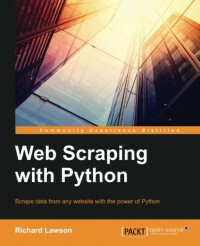 This book is aimed at developers who want to use web scraping for legitimate purposes. Prior programming experience with Python would be useful but not essential. Anyone with general knowledge of programming languages should be able to pick up the book and understand the principals involved. This book is a hands-on guide with real-life examples and solutions starting simple and then progressively becoming more complex. Each chapter in this book introduces a problem and then provides one or more possible solutions.